Recent recommended reducing, reusing and recycling links | How can I recycle this? 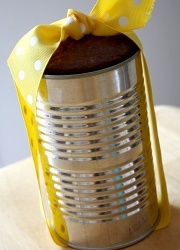 I love this simple but cute idea for baked gifts – using an old food can as a baking container and gift packaging in one. I first thought it was biscuits/cookies in the can – it would work well for those too, protecting them from getting crushed. These lamps from old piping are great – straddling the line between being industrial and looking like strange bulb-headed creatures! As someone currently seeking out baskets, this basket from blue jeans tutorial is definitely going on my to-try list. Finally, check out this table runner make by fixing together old doilies – very pretty work. The lamps from old piping look like lamps from new piping to me. In fact, far from being eco-lamps, these look like gross over-design and a hopeless case of the squandering of the world’s resources. Are you sure that they are made from salvage? Unfortunately thousands of perfectly reusable old lamps are thrown away every week in the UK. Yes, they very much look like they’re made from new piping – sorry for being unclear. When I’m posting these links, I’m not advocating people buying the item though, it’s just supposed to be for inspiration – and they could use the inspiration of those lamps to make their own out of used piping. I very much like Guy’s lamps and furniture too though – very imaginative (and inspiring) stuff. I love the idea of bread in a can, but am wondering how you get the stuff out to eat it..? I thought that too – I guess if it’s greased properly it might slide out…? I think as its flavoured bread and only a small portion they are just wanting you to eat it from the can, if you could ease it out it would be interesting to see if it kept the ripple effect :D.
about this topic here on your weeb page.